Dinner parties are more than just an excuse to get your friends together. They provide an opportunity to show off your cooking skills, exercise your creativity and introduce strangers to their soon-to-be spouses. There are few things more thrilling than a night when you can put aside your stresses and just live in the moment. If you live in Phoenix apartments, here are three reasons to start planning one today. Most people are used to being invited over for traditional-style parties where people stand around holding drinks while chatting in selective groups. Unless your friends are master entertainers, dinner parties aren’t always the most popular choice. They can be a lot of work and put pressure on the host or hostess. But people want to attend things that are a little different, and a dinner party can provide just the tweak you need to really spice up the conversation and have some fun. There’s an art to being a good host or hostess in Phoenix apartments, and just because we live in an age of smartphones doesn’t mean that the art should be lost. 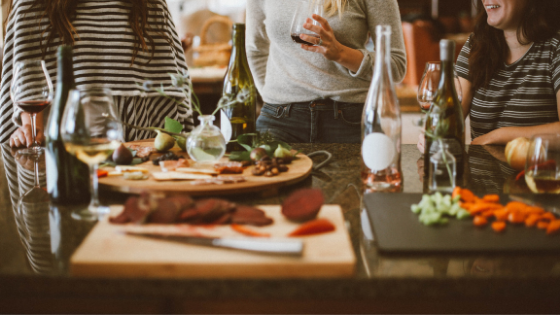 Hosting a dinner party gives you a chance to explore new flavors and improve your mastery in the kitchen. And it also teaches you important lessons about time management and relationships — all without feeling like it's a chore or an obligation. When people step outside their comfort zone, it leads to more lively conversations. It’s at the dinner table where people have a chance to voice their opinion and talk about the things that matter most to them. You can’t dictate or predict the tone of a conversation, but by throwing a dinner party, you give people an opportunity to communicate in a way that they may not experience very often. Who knows what interesting facts you might learn? The apartments in Phoenix are always more fun when you surround yourself with interesting people you want to learn more about. If you’re looking for a new home with a modern kitchen and more space to host all your friends, give Element at Deer Valley a call today to learn more about our availability.